Clarence Page- "What black parents must do now"
Michael Winerip - "... An Invisible Race Gap"
BERKELEY - John Uzo Ogbu, professor of anthropology at the University of California, Berkeley, and a path-breaking scholar in the fields of minority education and identity, died of a heart attack after undergoing back surgery on Wednesday Aug. 20, 2003. He was 64. 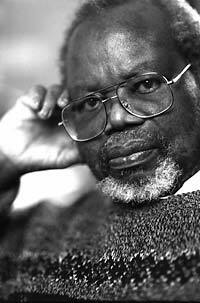 Ogbu is known for his work that attempted to understand how race and ethnic differences played out in educational and economic achievement. He stirred controversy in 1986 when he co-authored a study that concluded African American students in a Washington, D.C., high school didn't live up to their academic potential because of the fear of being accused of "acting white." His most recent book, "Black American Students in an Affluent Suburb: A Study of Academic Disengagement" (Lawrence Erlbaum Publishers, 2003) also drew widespread attention. Concerned parents and other members of the middle-class black community in Shaker Heights, Ohio, invited Ogbu there to help them understand why some black students in their highly regarded suburban school system were "disengaged" from academic work and performed less well than their white counterparts. He concluded that the black students' own cultural attitudes hindered academic achievement and that these attitudes are too often neglected. "In every article on the subject of minority education, inevitably there are references to John's work," said Herbert D. Simons, a UC Berkeley professor of education who co-authored a paper with Ogbu about minority education and school performance. "He devoted his life to the study of a very difficult problem - differential educational achievement among minority populations in the United States," said Stanley Brandes, one of Ogbu's colleagues in the UC Berkeley anthropology department. "He pursued this issue from a wide variety of standpoints, despite the fact that it presented no easy solutions." At the heart of his work was the way Ogbu differentiated among minority groups. "Voluntary minorities," he said, come to a new environment with their collective identity intact. "Involuntary minorities," he said, such as African Americans, formed their collective identity after coming to the New World and in the context of oppression by a dominant society. His distinction became part of the groundwork for understanding and debate on race and ethnic differences in educational and economic achievement. In the late 1990s, Ogbu played a prominent role in the debate about the place of "ebonics" or black American English. As a member of a task force on African American education in Oakland, Calif., he stressed that beliefs held about "standard" or "proper" English required in the classroom were incompatible with black vernacular English that is spoken at home and outside school. Ogbu considered ebonics a distinct and not inferior form of black English, and encouraged teaching of ebonics as a way to help African American students transition to traditional English. Ogbu was repeatedly recognized for his work. "The Chronicle of Higher Education" featured him in its 1997 article, "What 15 Top Anthropologists Are Working On Now." The same year, Ogbu was elected to the International Academy of Education and was appointed a Chancellor's Professor at UC Berkeley. Also in 1997, a special issue of "Anthropology and Education Quarterly" was devoted to "Ogbu's Theory," with contributions by an international group of scholars. He received the American Educational Research Association's "Research Contribution to Education" Award, and the Margaret Mead Award given by the Society for Applied Anthropology. An avid researcher, Ogbu published several books, numerous articles and chapters in books, with his writings translated into French, German, Japanese, Italian, Mandarin, Spanish and Croatian. Ogbu was born in 1939 in the small village of Umudomi in the Onicha Government Area in Nigeria. The son of farmers, he attended Hope Waddell Training Institute. He later went to Methodist Teachers' Training college and taught Latin, mathematics and geography for two years in a missionary high school. As part of his plan to become a minister, he attended the theological seminary at Princeton University. There he realized that he needed to know more about his own country, and turned to anthropology. Transferring to UC Berkeley, Ogbu earned his BA in anthropology in 1965, his master's degree in 1969, and his Ph.D. in anthropology in 1971. He began teaching in UC Berkeley's Anthropology Department in 1970, was awarded tenure in 1976 and was promoted to full professor in 1980. "John Ogbu's humanity and warmth informed all of his intellectual work. He didn't avoid the controversial questions but always brought a fresh comparative perspective to the answers he sought. He will be missed as a scholar, but also as a mentor and a friend," said former Ogbu student, Angela C. Davies, now a visiting instructor in the UC Berkeley anthropology department. Other than anthropology, his passions included reading and writing poetry, remaining active with the Nigerian community in the U.S. and in Africa, and his family, said wife, Marcellina Ogbu. In addition to his wife, Ogbu's survivors include four daughters, Grace Ogbu, Christina Ogbu, and Cecilia Ogbu, all of Oakland, and Elizabeth Ogbu of Cambridge, Mass. ; and a son, Nnanna Ogbu of Los Angeles. He also leaves several brothers and sisters.